Born in Kanagawa, Japan, Mayumi started ballet at the Hiraki ballet school and then later at Arts Educational school in London. In 1996 she was awarded the Dancing Times Choreography award and took part in the choreographic project “The Exchange” at the Royal Festival Hall. After her studies at the Benesh Institute in London Mayumi was engaged as a dance Notator with the Royal Ballet. From 1998 till 2011. She was involved in remounting many pieces of the repertoire including works by Nijinska, DeValois, Ashton as well as Forsythe, Killian, Ek as well as many other. She also notated many creations by Tuckett, Bruce, Bintley. 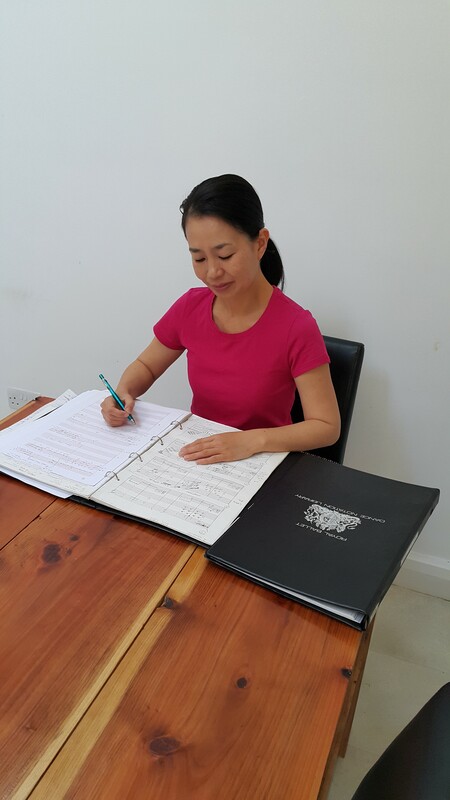 During this time, Mayumi also created eight short pieces as part of Draft works in the Clore studio at the Royal Opera House. 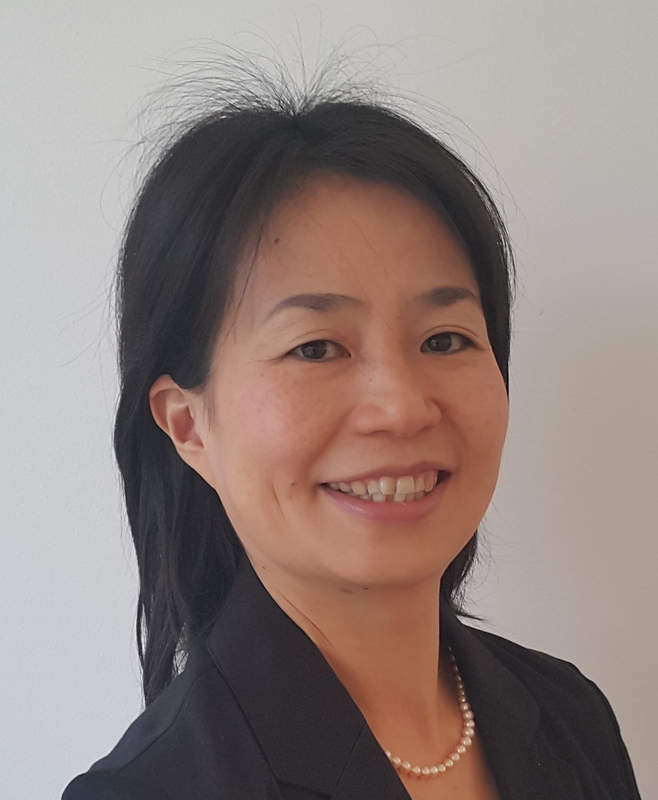 During the 2014-15 season Mayumi worked as the Librarian for the Benesh Notation department at The Royal Ballet as well as remounted the white acts of Swan Lake for English National Ballet. She is now a freelance notator and mother of two children. Last season, 2014-15, I worked as a part time librarian with The Royal Ballet Dance Notation department. I had the rare opportunity to go through all the notation scores from the 1950’s to the present day. This was part of a very brave project initiated by Senior Benesh Notator Anna Trevien. The amount of work to sort out all the scores and make a detailed catalogue is huge and I feel I have contributed to only the first few steps. Through the generations many notators have been dedicated to preserving the repertoire of The Royal Ballet. Notating a ballet takes a lot of energy and concentration, for instance 5min of a complicated section of a ballet may take up to 3 weeks to write out to a master score. Some scores were written in an era where not so much technology was to help, so they only had their memory to rely on and the few rare films available. Nowadays, notators can film the rehearsals daily, however they face other challenges. The choreographers can create an unbelievable amount of new material each day and it will often be changed or discarded daily. Many dancers can be doing many different movements simultaneously and the choreographic language may be very contemporary, which is harder to record in notation because of the floor work and wider use of range of body movement. Also the music can be challenging and hard to transcript into dancer’s counts. To start our archiving challenge, we created a new digital catalogue to include all the Benesh Notation scores details. It includes general basic information like the title of the production, which year of creation, choreographer ,composer ,the Benesh notator who wrote it and then who might have updated it, who taught it and if any music scores or videos are available and so on. While doing this we also add information about the state of each score and we decided on three main categories a rough notes/daft, working score and master score. We also have a section where we add any other specific notes about each score. *During the creation process of a ballet the Notator involve in that production will be daily taking notes, these we will call rough notes or drafts. Until the first night the choreography is in constant evolution and notators record as much as possible during that process. These scores tend to look rather messy because of the many adjustments made during this process. Some scores unfortunately never get past this stage; this can be for many reasons but one of the main causes is a lack of time. * After the premiere, the notator should normally take time to write out either a working score or a master score. The working score is based on the draft score as well as on any recorded films from the rehearsal and the performance. It will include loads of information about the choreography of the production and will be very useful for remounting the production in the future, but will not look as pretty as a master score as it’s usually written in a hast. These are the most common scores available and are very valuable tools. 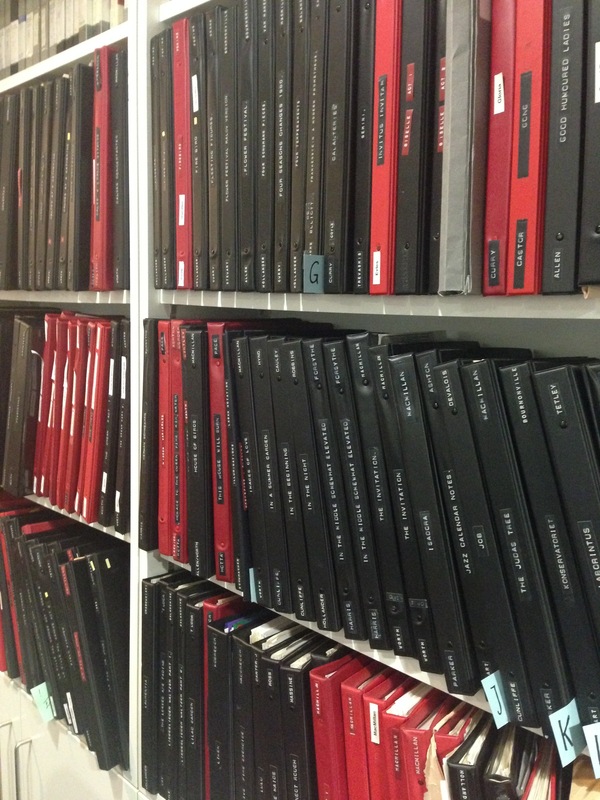 After creating the catalogue, we started to sort out the actual score folders. Some of them have a lot of added sheets to update the score and the work of keeping it in order and all clear was quite hard work especially when I was not involved in the production myself in the past. For security reasons all the hand written originals need to be sent to archive, this is a special storage unit that is located of site from the Opera House. So we end up keeping at least one clean photocopy of each production in house. During this process we started to scan the scores as well as photocopying them. This has a dual purpose, to keep a digital copy of the original score and to save time in retrieving scores that are kept in archive. In The Royal Ballet Notation Office there are pages after pages of ballets which made Royal Ballet history. I am particularly in awe of Faith Worth’s scores, one of The Royal Ballet Benesh Notation pioneers. She has written page after page with her amazing memory skill and musicality. But my personal favorite are master scores written by Grant Coyle, there are very clear and packed with information, it’s like reading a story book. I also like his very warm bold lines in his notation and I am not saying this just because he was my boss for 13 years! Thanks to the notation department’s own new scanner, I hope it will be much easier to make the back up now on and this project will continue moving forward smoothly. Not many companies are this dedicated to preserve their repertories and it will benefit the quality of the staging for historical pieces as well as new pieces for many years to come. Great piece and nice photos.